In November 2017, Bectu members voted in support of a collective agreement covering major motion pictures. This will cover feature films with a budget in excess of £30 million. What is the BECTU/PACT Feature Film Agreement? It is a set of guidelines that will apply to all feature films with a budget of more than £30 million. It was voted in by a massive 87.61% majority and took over 5 years of negotiation to achieve. It is a fixed working agreement that all productions should stick to and refer to, so no more cherry-picking terms and conditions by producers! The negotiating committee has included both BECTU and PACT officials and also representatives from each branch in the BECTU union and representatives from the PACT union. It is important to note that the Costume & Wardrobe branch has been represented at every single meeting. That means that at every meeting, one or more of your colleagues has been present and has negotiated on your behalf. How will this agreement affect me? This agreement will affect you if you work on a major motion picture, defined as a film having a budget of £30million or more. The fine details may take a little bit of getting used to but the main points are covered below. By far the biggest success of these negotiations is the erosion of "hours given for free". Prep and Wrap: Previously, most costume departments were expected to work a normal day plus "reasonable prep and wrap". Under the new agreement, although prep and wrap hasn't disappeared completely, it has, firstly, been acknowledged and, secondly, been set at half an hour at the beginning and half an hour at the end of each day. This shouldn't change from production to production, supervisors won't be having to negotiate how much time their department gives for free. This is a major step towards getting rid of it completely in the future. Overtime: Overtime has changed to a pro-rata system, so 1.5T for non-camera OT and 2T for camera overtime, payable in 30 minute and 15 minute increments respectively. This is good news for most, except juniors and trainees. There will however be an overtime floor (minimum overtime payable) set at £25. Grace: The grace period has gone. If shooting continues after wrap, overtime will be paid immediately, in 15 minute increments. 6th and 7th Days: 6th days will be paid at 1.5T for the actual hours worked and 7th days at 2T, with a minimum guarantee of 6 hours for non-shooting crew and 8 hours for shooting crew. Night work rules are more clearly defined. These include a £20 premium per night and a turnaround day after a period of night work, for all crew, including dailies. Broken turnarounds will be paid at 1.5T. The agreement contains a clause that means it will be reviewed at regular intervals, points re-worked if necessary. Meaning that it is a step forward, but not the final destination. 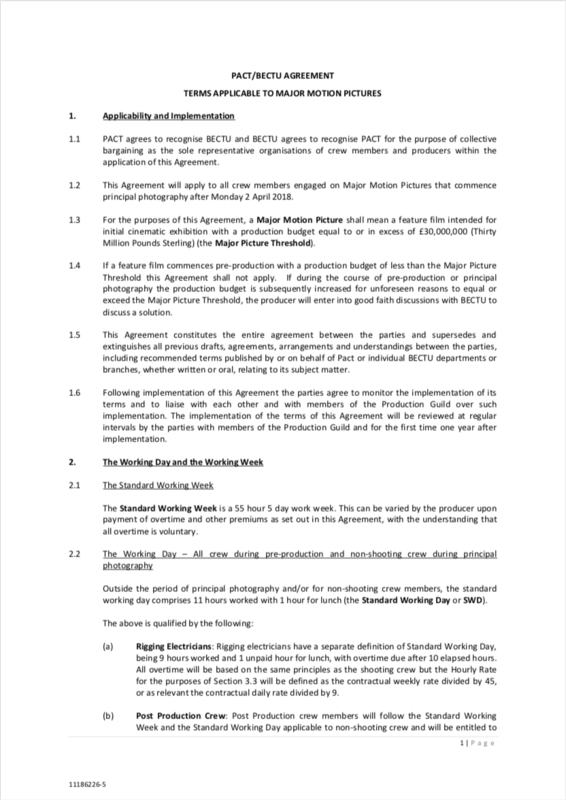 The full agreement can be viewed by clicking on the link at the bottom of the page or on the Bectu website. You can print off and keep your own copy. Please get to know it thoroughly, the points highlighted above are explained in more detail in the full document. When Did the agreement come into force? The new agreement was implemented on 2nd April 2018. The fact is, that reaching this agreement has been a negotiation. This means that while we have won ground on some points, we have had to compromise on others, but we believe that they have been worth making. This agreement will put all departments on parity when it comes to the terms and conditions and will also benefit dailies, who, in the past, have not had the same benefits as contracted crew members. I'm not a BECTU member, do I still get to vote? NO! If you want to get involved and have your say, please join us. You gain nothing from going it alone but if you join BECTU you will have a union at your back to fight your battles, a bunch of like-minded people helping and supporting each other, as well as a host of other benefits!